A girl chosen to save a fae kingdom from the curse of eternal night. A handsome and mysterious fae prince who has long awaited her coming. A terrifying dark secret behind a seemingly perfect fairy tale. Myth decides to end her life when a horrible prank makes her the laughing stock of the whole school. But a desperate wish calls upon a mysterious fae, one who has come for Myth, the princess foretold to end the darkness that threatens the fae kingdom of Yearning.At Yearning, Myth meets Prince Vesper, the handsome and perfect fae prince who gives Myth the happiness she yearns for. All she needs to do is be his princess and use her power to defeat the darkness. Once every full moon for three mortal days, Myth gets to live the life of a fairy tale princess and have all her dreams come true. But behind all that bliss, Myth feels something is amiss. Despite all the love Prince Vesper showers her with, she knows he isn’t telling her everything. Is Vesper the perfect prince she thought out to be? What dark secrets lie behind Yearning? 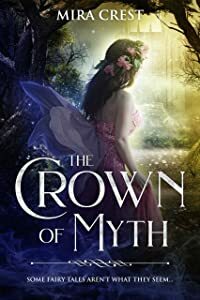 Will Myth unravel them before it’s too late?--The story is set in a modern world and a fairy tale world, a cross between a fae paranormal romance mystery and dark fairy tale.--The Crown of Myth is the first book in The Fae Queens series, comprising 2 parts.